Through collaboration and creativity, the Office of Marketing develops and implements integrated marketing and communication plans to support the university’s recruitment, retention, brand recognition, and goals. We are change agents, innovators, storytellers, and knowledge builders across a range of disciplines, including marketing, advertising, writing, social media, video, email, print, web, and photography. We continue to integrate and collaborate more deeply across the university by providing leadership, sharing best practices, and learning from university stakeholders, competitors, and other professionals. We provide the framework, resources, and expertise to deliver consistent, appropriate, and timely information that strengthens the university’s brand and image. Research, data, and results guide our actions and investments. We create, maintain, and enhance relationships with our students and their families, faculty, staff, alumni, and the community. Wright State University was honored to host the 2017 Science Olympiad National Tournament (SONT). Teams from around the nation represented their states at the highest level of academic achievement in science, technology, engineering, and math. The weekend featured intense competition among 120 of the best Science Olympiad teams in the nation, striving for honors in events like Electric Vehicle, Disease Detectives, and Hovercraft. Each of the 46 events requires in-depth understanding of rigorous science content, teamwork, and real-world problem solving. The Office of Marketing was an integral part of planning and executing this complex event. We worked closely with the Science Olympiad organization, university leadership, Event Services, Nutter Center, IT (CaTS), Foundation, and academic units to coordinate the many details of this multi-day tournament. An event of this magnitude has many moving parts. It required months of planning, working together with a wide variety of internal and external folks. The overall goal was to ensure that teams and visitors had a smooth competition and a great experience on our campus. From a marketing perspective, this was a fantastic opportunity to show off everything Wright State has to offer to high-achieving students. Prior to the event, we needed to provide teams with all the information they would need to plan their trip and communicate competition-specific details to coaches and event supervisors. Once teams arrived, we had to ensure that they could easily navigate campus, find merchandise and food, and have some fun in their down time. We also needed to pull off two huge ceremonies in the Nutter Center with the same level of excitement and production value as a professional awards show. The good news was that Wright State hosted the SONT in 2013, so we had a basic blueprint to follow. However, in 2013 the university was in a very different financial situation. We had to find creative ways to meet the same standards of quality with fewer resources. Many things that were done in 2013 by outside vendors were pulled in-house. It was a daunting task, but one that allowed us to stretch ourselves and try new things. We had a blast working on some types of projects we don't often have the opportunity to work on. The first order of business was to establish a visual identity for our tournament that fit harmoniously with the Wright State brand. We created a flag logo that utilized the official Wright State green and gold and included our university single line wordmark. This logo was the main branding element that was used on everything related to the tournament. We collaborated with the university bookstore to get this logo on several merchandise items that were sold leading up to and during the tournament. We also created icons for each of the 46 unique competition events. The icon shapes were inspired by nautical flags and also used our official colors. These event icons appeared on signage, in the program, and on the official event T-shirt. As we got closer to the tournament, we expanded the branding into a fuller look and feel. We took a map background and layered on the tournament logo, some artwork from the icons, and an airplane with a dotted "route." These elements were then adapted into the covers of our printed programs and maps, signage templates, web content, and graphics for the two ceremonies. The Office of Marketing created several printed pieces for the Science Olympiad National Tournament. Early on, we created a document to help Advancement attract outside sponsors. It explained what Science Olympiad was and what would happen at the tournament. It also explained the two levels of sponsorships available. Next, we created a small piece that had just a campus map and the competition schedule to help everyone easily navigate campus. This was designed to fold down small enough to fit in each participant and volunteer's name badge holder for convenience. The final and most important piece we worked on was the tournament program. Not only did this piece need to communicate a lot of information, it was also expected to serve as a souvenir for students and their parents. It had to be laid out in a way that presented a wide range of detailed information without overwhelming the reader. The final 23-page booklet looked polished and also prominiently featured great content about Wright State University. We created an event site for the tournament that communicated a vast amount of information to both internal and external audiences. The Plan Your Trip section gave visitors everything they would need to do just that. It had information on accommodations in campus housing or local hotels, meal plans and on-campus dining, local emergency resources and tourist attractions, etc. The Competition section included schedules, photos of the rooms each event would be held in, a roster of participating teams, and other event-specific information. The Additional Events section featured details on the Opening and Awards Ceremonies, team banquets, and the fun activities academic units had planned for students prior to the competition day. There was a Coaches Corner page where coaches could read FAQs that pertained to them and download the forms they would be required to turn in at registration. There was a section for volunteers that linked to a sign-up form. We also included pages to help visitors learn about Wright State and about Science Olympiad, as well as a contact form. In the weeks leading up to the event, the web team made updates to this site nearly daily as more information became available. They made live changes during the event, posting the final results within minutes of the Awards Ceremony's conclusion. Following the tournament, we've transitioned the site into an "evergreen" state so that it now serves as more of a historical record of the event. We've stripped out content that isn't relevant after the fact and changed verbs from future to past tense. The homepage now prominently features a highlights video and a link to the final results spreadsheet. We've also added a photo/video page so viewers can watch the Opening and Awards Ceremony videos, see a photo gallery, and purchase photos from the event from the university's SmugMug account. Perhaps the biggest task of the entire tournament was pulling off the two massive ceremonies that officially open and close the competition. On Friday night, teams filled the Nutter Center with fun costumes and electric excitement. Representatives from each team marched into the arena during an energetic Parade of State. Several speakers then took the stage to welcome competitors and congratulate them on making it this far. Wright State reseacher Elliot Brown, Ph.D., gave the keynote address, presenting his latest work on terahertz radiation. On Saturday evening, teams dressed in their best to learn who took top honors in the day's competition. Medals were awarded for the top six finishers in each of the 46 individual events and trophies were given to the top 10 teams overall in each division. Along the way, there were special scholarships and prizes handed out by sponsors and for categories like exceptional coaching and team spirit. Both ceremonies needed to have the same production values as a professional concert or awards show. With attendance of more than 3,000 and thousands more watching the livestream, this was a great opportunity to further the university brand at a national level. The Office of Marketing worked with CaTS, the Nutter Center staff, and Purchasing to draft the ITN and evaluate bids for an outside vendor to bring in staging, lighting, sound, and large video screens. We coordinated with the chosen vendor, Communicore, as well as the local stagehands union for weeks to plan every small detail of the ceremonies. Our office produced all of the graphics and animations used throughout both events. This included all lower third content for the livestream and graphics for all four screens that make up the scoreboard in the center of the arena. We wrote the scripts for several portions of the ceremonies, including Doug Fecher's welcome address on Friday, which highlighted the similarities between Science Olympiad competitors and the Wright brothers. We also produced a "Welcome to Wright State" video to further show off all our university has to offer. On both nights, teams would be milling about the Nutter Center for a few hours prior to the start of the ceremonies. We capitalized on this captive audience and used that time to market Wright State to these students. We curated several hours of existing video from the Wright State Newsroom and cut those segments together with trivia slides we created that featured fun facts about Wright State, the Dayton region, and science in general. We believe the final result was a preshow that was both informative and engaging. Overall, the ceremonies went very smoothly and we received lots of positive feedback from coaches, students, and parents. The coordination of all organizations, materials, website, print, and digital showed a high level of integration across our university and elevated our brand on a national scale. The Office of Marketing is very proud of the outcomes produced by this event and looks forward to further opportunities to work on similar projects. The Opening Ceremony livestream was viewed by more than 800 worldwide and the Awards Ceremony streamed to more than 2,400. The PDF of final results from the tournament was downloaded from our website more than 4,000 times in just the first week following the event. Video and graphics assets produced for the tournament will be used in other contexts to maximize our time investment on this project. In the Office of Marketing, we pride ourselves on our exceptional attention to detail. However, we're all human and occasionally mistakes do happen. In the weeks leading up to the SONT, our team worked countless hours to create the hundreds of graphics shown on the multiple screens throughout the two main ceremonies. We carefully reviewed each graphic for typos, paying special attention to getting the names of each speaker, team, and sponsor exactly correct. On the night of the Awards Ceremony, three members of our team sat with the production crew backstage, prepared to spring into action and make changes on the fly if necessary. The event went perfectly smoothly. The winning teams were announced, the presenters thanked everyone for attending the tournament, and the house lights came up. Just as we started to relax and pat ourselves on the back for a job well done, we noticed a tiny typo on the closing slide. "Final results are available at wright.edu/sont17." Just two transposed letters in a common word. For professionals who had just pulled off a Herculean task, it was a heartbreaking way to end an otherwise amazing event. But it was a great reminder to never let our guard down, even on the parts of a project that seem the simplest. That said, the Science Olympiad National Tournament was a fabulous event and something that we are truly proud to have worked on. Nearly every member of our staff played a role in this project and our efforts helped Wright State University to shine on a national stage. 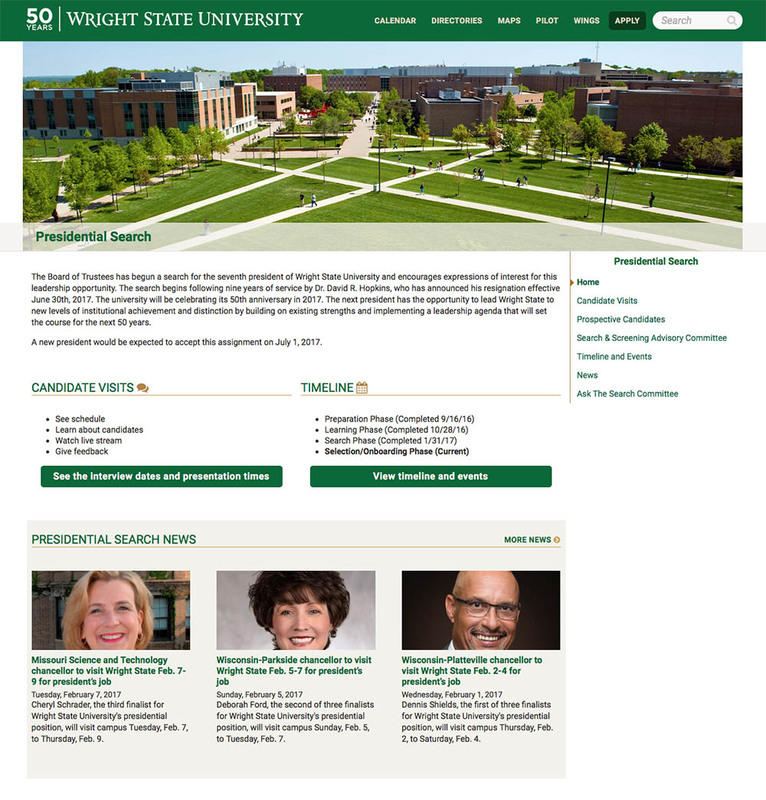 In the early summer of 2016, the Board of Trustees announced the start of a presidential search process to select Wright State University's 7th president. By mid-summer, the Search and Screening Advisory Committee (S-SAC) was established and a search firm had been selected to increase our candidate pool and provide confidentiality during the national search. The Office of Marketing and the Office of Communications both had staff selected to support the S-SAC. An S-SAC subcommittee focused on marketing was organized and worked closely with our teams. Our objectives were to create public-facing materials to attract potential candidates and to communicate as transparently as possible to the entire university community throughout the search process. This resulted in three significant products; a website, a search profile document, and a video. The presidential search website was the primary method of communication to a broad range of audiences, both external and internal to the university. It was decided early on that the primary audience focus would transition throughout the phases of the project based on the current activities of the committee. During the preparation phase (Phase 1) of the search, an initial website was launched that focused on communicating the processes and timeline to largely internal audiences. During the learning phase (Phase 2), the site advertised a series of internal and public events that were hosted to help gather requirements and attributes for the search profile. During the search phase (Phase 3), the site transitioned focus toward prospective candidates as we worked closely with our search firm to advertise the position nationwide. Finally, during the selection and onboarding phase (Phase 4) of the search, the site shifted back to focusing on communications with internal and external audiences. As part of the process of ensuring transparency, all communications that were sent through emails to internal audiences were archived in the news sections of the site. We plan to leave the site live as an archive of the process for some time to come. The written profile is an integral component of a presidential search process. This document introduces the university to prospective candidates and highlights the opportunities here that might entice them to apply. The marketing subgroup started their work on the presidential search profile immediately. We developed an outline and then gathered previously existing materials that could be adapted to make up the majority of the search profile while the full S-SAC committee worked on finalizing the content for the Leadership Agenda and Qualifications, Experience, and Leadership Attributes sections. Once we had everything written, edited, and approved, the copy was laid out with photos and graphics to make it cohesive and visually appealing. At the first meeting of the S-SAC marketing subcommittee, we suggested doing something unique beyond the search profile and website most universities develop. With Wright State's recent challenges we wanted to make sure we clearly conveyed the incredible opportunity Wright State offered to potential candidates. We shot several interviews using a range of both long-standing and newer employees to discuss the potential they see in Wright State. The video was edited together with existing b-roll and placed on the presidential search website. To provide the largest possible and most diverse pool, we worked closely with our search firm we to advertise in the following publications. A total of 61 applications were received by the December 5th deadline. The S-SAC was pleased with the size of the candidate pool, the quality of candidates, and the diversity of those who applied. The candidate pool included current sitting presidents, chancellors, deans, chief academic officers, university vice presidents, professors, and business leaders. Most candidates were external, but we also received several applications from within our university. In addition, most applicants possessed doctoral degrees, but we also attracted candidates with medical degrees, law degrees, master's degrees, and some with multiple advanced degrees. At least one candidate was a Rhodes Scholar, several international candidates had applied, as had several with experience in research universities, and the diversity of our pool according to gender, nationality, race, experience, and background was impressive. It was an excellent pool and highly competitive. Of these candidates, three were invited to campus for a series of open forums with stakeholder groups. On March 6th, Wright State University named Cheryl B Schrader as our president-designate. The College of Education and Human Services website was migrated into our Drupal content management system (CMS) in 2014. Since that time, the Office of Marketing has worked on numerous college websites and completed user experience (UX) testing with multiple different groups of both current and future students. Utilizing what we have learned, we wanted to make the College of Education and Human Services website our first full 2.0 college site since migrating the site to the CMS. User experience testing for different sets of users has had lead us to use quite different information architecture and navigation than when we built this college website in 2014. It was necessary to update to the latest standards while also aligning with a greater focus on mobile navigation and content layout. The new pages would be much more streamlined and flow better on smaller devices. To make this signifigant of a change, we ended up rebuilding and reflowing all content pages across the whole site. Though it was more work, this would also allow us to review content more closely than is normally possible. 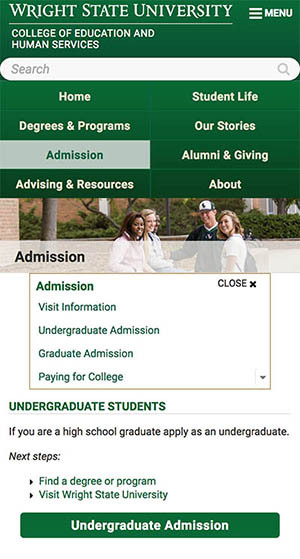 The resulting site is closely aligned with the most recent Wright State University top-level pages and homepage. The new college homepage—much like the university homepage—focuses on telling the success stories of the institution by integrating alumni, student, staff, and faculty profiles, targeted news stories, and social media. Though making all new pages for content was additional work it allowed us to create a much higher level of polish than would have been possible through a minor facelift. We will be executing the same technique as we work on the rest of the 2.0 college websites. Making all new pages came with their own challenges. We will be paying closer attention to user permissions and redirects when using this model in the future. We also learned we should take more screenshots of the existing sites before we roll new for documentation uses, like this blog post.